NMArtists.com is a website designed specifically for New Mexico Artists. It is run by Lucht Studios, LLC, a small independant website design company in Albuquerque specializing in websites for artists, galleries, art events and art organizations, as well as artistically designed websites for small business. Our goal at NM Artists is to spotlight the vast array of art being created here in New Mexico. We also want to foster a sense of community amongst our members and make them feel like they are part of a larger whole, all the while providing a great marketing tool that is easy to use and affordable. 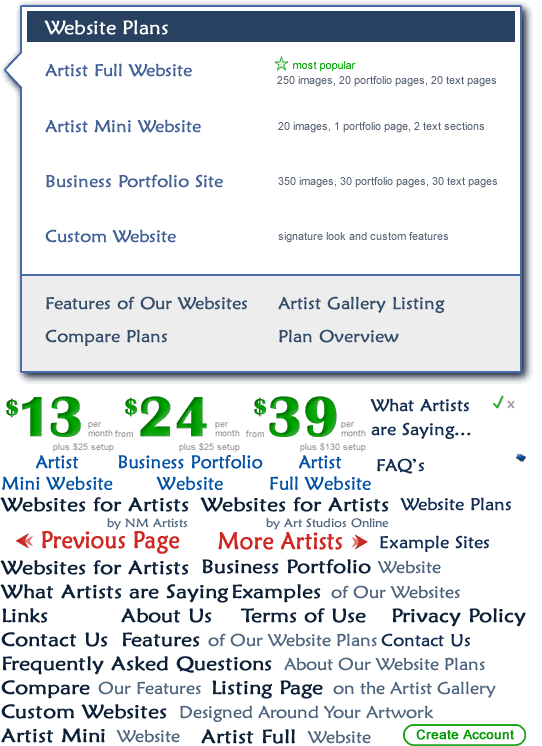 In addition, we now have a national website for artists called Art Studios Online. This is a very exciting time for us as we branch out to even greater things. Members of the NM Artists website also get a free page on Art Studios Online affording them national as well as local exposure.